Nokia Lumia 610 release in India : Features, Review, Specs | Free Pc to Phone Calls, Free Voip Calls to India International ! Nokia lumia 800 and 710 have already been launched in India market and are easily available on flipkart. But the much awaited phone in Indian market is the low range phone (approx 10K-11K) Nokia Lumia 610. 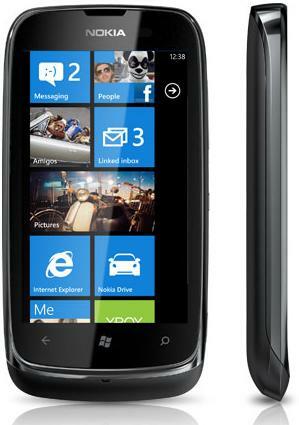 Nokia Lumia 610 has some good features and the price is also less. This phone has created a lot of hype in the market and many people are eagerly awaiting for it. The main reason being comparable features with high end Nokia 710/800 but price being very less. Lets just quickly check out this phone features. Well as I can see that the phone has good internal memory of 8GB which is good for music, photos and all. But the lack of a card slot makes it difficult for people add movies and all! At the camera side, the primary camera is good at 5MP but again lack of secondary camera means NO Video Calls on Nokia Lumia 610! A big disappointment. But yeah what can you expect at such low price. No doubt the screen response of the phone is good. I saw a good user review on gsm arena and thought to share you with all. Display : clear , bright even on direct sunlight . The only thing is that I'm still not sure if it has Corning Gorilla Glass - so I wrote to Corning so that can make that clear once and for all. Wireless connectivity : excellent as far as I'm concerned...the device lets you know instantly on a "top of the screen bar"
Battery life : good so far ! Applications : now , here We would need more applications for this device ! on screen weather for instance , something like Psiloc World Traveler or WorldMate .....I was very happy with those to applications on My previous phone ( Nokia E 63 ). Personalisation: Could be better ! Overall experience : fun , fresh , could have not expected anything less than this from Nokia !" Coming to the phone's expected price in India. Phone is not yet launched in India, however many people in the industry believe that the phone approximate cost will be around 10K. With Samsung and HTC low range android phone already in the market, it will be difficult for this phone to compete with them. My personal choice will be Nokia Lumia 610 as compared to low range samsung or htc mobiles. The reason being speed, processor, and user experience. No doubt that android mobiles are good but android works good only on high processor. I have used low range samsung galaxy mobile and a big NO from my side. These phones hangs, application crashes (facebook does not even open) and the lag in the devices. So anyday Nokia Lumia 610 is better than these (below 10K range android mobiles) simple because of processing speed and the response. But yeah, if you are an Android fan then simple go with Android, Nokia ain't for you! Few days back, Nokia announced in the Nokia Strategy Summit that the Nokia Lumia 900 and Lumia 610 would hit the India market in 3rd Quarter of 2012. That's again a long wait! Nokia Lumia 610 is nice phone but not good enough to compare with Android phones especially if it's SONY one. I when to buy Xperia Pro, i saw Lumia 610, it was not that much interesting, i looks too official. If anyone looking to purchase smartphone other then iPhone, go for Sony.